"These pictures are shocking and send shivers throughout the body. 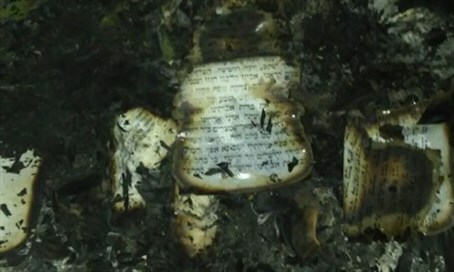 I am certain that holocaust survivors who survived kristallnacht and founded Gush Etzion, never dreamed that they would see such pictures of burned books here in Israel under Israeli authority," said David Perl, Head of the Gush Etzion Regional Council on Saturday night. "The government of Israel must get the wild Arab violence, that claims both the lives and sanctity of Israelis, under control. We expect that the international community will condemn this hateful, shocking and criminal act."